This is a review of the Violent Beauty Wings equipment for Game of War which is part of the Xenas Gear equipment set. 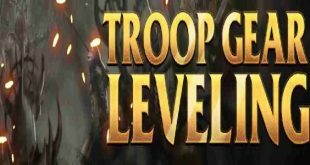 Troop Attack is normally more useful defensively (as when attacking it is generally better to focus on one troop type), but as we will see, this is just the best combat accessory full stop. On paper this looks like an above average combat item. The 33% combat boost is good but 10% Troop Health is fairly mediocre. But when you consider this is used in the accessory slot it becomes the very best combat accessory there is. It is notably better than any of the alternatives. An accessory with high troop attack boost and troop health boost is great and useful in all combat situations. At just under 100m silver this item is expensive. Don’t build this as your first combat item as there are better items out there. But if you are looking for a combat item for the accessory slot this is the best there is – build three. I understand this is more about the stats of the gear, but when crafting the violent beauty wings, the chance of crafting legendary is 80%, but when I craft it without using speedups it has completed at level 5, but some gear that I’ve crafted at 80% using a day speedup completes at legendary status, how come?